After much consideration and communication between our members, we have determined that the make-up date for the postponed April event will be MAY 5, 2019. While we regret that we were forced to do so, we continue to believe this postponement was in the best interest of everyone involved based upon the projected weather forecast for the area. It should be noted that, in fact, a funnel cloud was observed in the area and several properties received extensive damage from the violent storms just a few miles from Lake Santee that early afternoon. As always, we will be meeting at the main beach shelter house for the pretournament meeting and boat draw. Our tournament hours will remain the same as scheduled. We regret any inconvenience this postponement may have caused, but, as stated previously, our members' safety is our top concern. Thank you for your understanding! As many of you are aware, we are faced with a nasty outlook concerning the severe weather forecast for overnight and tomorrow. After taking this into consideration, we feel it is in the best interest to postpone the first Lake Santee tournament scheduled for tomorrow, April 14th. Everyone’s safety is our utmost concern and large hail, high winds, dangerous lightning, and severe storms can’t be taken lightly. We are working at determining a makeup date to be held in the next few weeks. 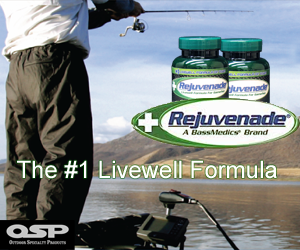 Stay tuned to our Facebook page, USA Bassin' page, and text messages for more information. We are truly sorry for any inconvenience this may cause, however everyone’s safety is our biggest concern. Thank you for your understanding..
We have received several calls as to whether we will be fishing our first tournament of 2019 on April 14th due to the potential severe/inclement weather. Our anglers' safety is our utmost priority. With that being said, at this time, the event will still be held from 7:00 AM until 1:00 PM as scheduled. HOWEVER, WE WILL BE MONITORING THE SEVERE WEATHER OUTLOOK VERY CLOSE!! We will strive to make a determination as soon as early Saturday afternoon as to whether we would be forced to postpone the event. The plaques have been ordered. A big thank you goes to Ronda Peetz and all the great folks at Tree City Properties for sponsoring our April trophies! Our first USA Bassin' Lake Santee Division 47 2019 tournament will be held April 14th from 7:00 AM until 1:00 PM! Don't miss out on the fun!! In just three short weeks, we will kick off the 2019 Lake Santee US Bassin Division IN-47 tournament season! Spring is upon us so make plans to take part in all the fun. If you haven't registered as a USA Bassin' team, but are planning to take part in the events, please get with us as soon as possible so we can get that completed before April 14th! Thank you and see everyone soon!! P.S.- The word is the bass are really starting to bite at Lake Santee! Well, March is almost here and with that brings the start of the 2019 USA Bassin' season here in the Hoosier State! Now is also the time to start thinking about getting your team registered to take part in the the USA BAssin' trail, including the Lake Santee IN-47 Division. As many have done in the past, please contact Chip or Lisa about getting this completed. Spring fishing is just around the corner!.. The 2019 Lake Santee USA Bassin IN-47 schedule has been approved by the board and is now set. We are looking forward to another phenominal season at beautiful Lake Santee. Please follow the Lake Santee USA Bassin IN-47 for up to date information through out the year. The 2019 Lake Santee USA Bassin IN-47 schedule has been determined.. Tentatively!! We have taken into consideration the NUMEROUS other trails some of our members compete in and attempted to chose dates which least conflict in the upcoming 2019 season. This schedule is tentative as the dates must first be approved by the Board of Directors as mandated by Lake Santee Property Owners' Association rules. Should any changes be necessary in the upcoming weeks, we will post those changes immediately. It's getting to be that time of year... we have started looking at dates for the 2019 Lake Santee USA Bassin' IN-47 schedule! If any of our members are considering fishing additional trails, please let us know by either a phone call, text, or email which trails you are interested in taking part. As always, we will attempt to make this year's schedule as non-conflicting as possible for our members. We hope to have our 2019 dates selected by mid-December to present to the Lake Santee Property Owners' Board for approval at the January meeting. Good luck to all the Lake Santee IN-47 Division teams who are taking part in the upcoming USA Bassin' Regional at Lake Monroe! Tight lines and have a safe day! What a way to wrap up a great season at Lake Santee for the 2018 U.S.A. Bassin' IN-47 Division! Matt and Scott Perkins capped off a great year with a tournament win on Sunday, August 12th, locking up their place as Division Champions for the season. The father and son team proved that consistency always comes out on top as their season included a win and two second-place finishes, along with two third-place finishes. Their catch for this tournament was three bass which totaled 8.35 pounds. As evidenced by the lower than normal weights, Philip and Dustin Miller took the second place spot in the tough event with two bass which totaled 6.40 lbs. Craig Duncan and Kyle Hohenberger only had one fish to bring to the scales, but made the most of it with a 4.28 lb. big bass of the day. We would like to thank all of our teams for a great season, both on and off the water. A lot of great folks make up the IN-47 Lake Santee Division, and we are truly blessed by everyone's friendship. We would also like to wish the best of luck to all of our teams who will now be looking toward the upcoming 2018 Regional Tournaments, with hopes of qualifying for the 2019 Ranger Classic at Kentucky Lake. Good Luck to ALL!!! A special thanks goes out to Bryant's Bar and Grill Restaurant for sponsoring this month's winning plaques. Bryant's B&G is located near the entrance of Lake Santee and serves great food, making it a regular stop for most of our teams after a wonderful day of fishing at the lake. The fourth bass tournament of the 2018 season was held at Lake Santee on July 22. The nine teams who took part were met by rain at the take-off but that transitioned to a beautiful summer day by the time the weigh in rolled around at noon. The previous day’s storms apparently affected the fishing, however, as only one team managed to bring a five bass limit to the scales. The father and son team of Tim and Carson Tennell’s five keepers weighed 14.21 pounds, allowing them to walk away with the win. Second place was captured by Phil and Dustin Miller with four bass which totaled 12.22 lbs., while third place was taken by Scott and Matt Perkins with three bass which weighed 11.84 pounds. The Perkins’ bag also included the day’s big bass, a 5.14 lb. beauty. In total, four bass over four pounds were weighed in by our anglers for the event. After this month's event, the overall division race has really tightened up. The points leader title is definately up for grabs at the August (and final) event! We would like to thank Celina Raver, owner of Revolution Salon, in Greensburg, Indiana for sponsoring this month’s plaques. Be sure to see Celina and all the great folks at Revolutions for all your summer and back-to-school beauty needs! Thank you, Celina!!! As everyone can see, even under relatively poor fishing conditions, Lake Santee continues to exhibit quality bass fishing. This is due in no small part to our anglers’ sense of conservation along with great management practices utilized by the L.S.P.O.A. under the guidance of Aquatic Control. Everyone can help do their part by following the examples of our tournament fishermen and women… Please PRACTICE CATCH AND RELEASE on Lake Santee’s bass. By doing so, we will all ensure that our beautiful fishery continues for years to come. Our fifth tournament of the 2018 season will be held on August 12, 2018 from 6:30 until 12:30 PM. The July Tournament results are posted. A detailed report will be posted in the coming days! Many of our teams have accumulated the required 250 points to register for upcoming 2018 U.S.A. Bassin' Regionals scheduled for later this fall. Remember that your starting position is determined by the team's registration date into the event. Early entry equals earlier boat number!!! Register now! On Sunday, June 10th, 2018, thirteen teams of Division-47 Lake Santee anglers took part in the third event of the 2018 season at our beautiful lake. The fisher-men, and women, were greeted with beautiful sunrise and warm morning temperatures as they took to the water to see who would bring home the trophies and prizes. The team of Rob Merriman and T.J. Edwards outpaced everyone with a five bass limit weighing 18.29 pounds to take top honors. Matt and Scott Perkins continued their winning ways, finishing a strong second with 17.64 lbs. John and Brad Wilson caught the tournament’s big bass for the second time this season with a 5.76 trophy largemouth bass. Great job to all our teams as 50 keeper bass were caught during the event. Each bass was carefully weighed in and released alive back into Lake Santee to be caught again and again in the future. This month’s trophies were sponsored by the lake’s own Ronda Peetz and all the great people at Tree City Properties in Greensburg, IN. If anyone is interested in owning property at beautiful Lake Santee and experiencing the fantastic bass fishing, please consider Ronda and the Tree City Properties folks for all your real estate needs. Thank you, Ronda, for your generosity! 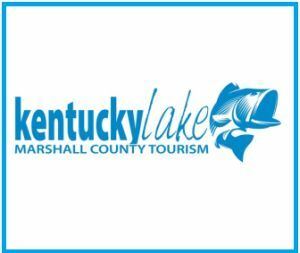 Help us ensure that our lake continues to provide phenomenal fishing for everyone, please follow the bass tournament anglers’ lead and practice catch and release on all of Lake Santee’s bass. ***June 10th results are posted. A tournament summary will be posted soon! We are just a few short days away from our third event of the 2018 season for the Lake Santee IN-47 Division. We have received this month's plaques from the engraver and they look great. Many thanks to owner Ronda Peetz and all the great folks at Tree City Properties in Greensburg, IN for sponsoring the event's tropies! We will be starting at 6:00 AM for this event, so please have your boat in the water and be present at the shelterhouse by 5:30 AM for the pre-tournament meeting. Remember that life jackets must be worn any time the combustion engine is in use. Safety First! See everyone on Sunday, June 10, 2018! What a difference a few weeks makes at Lake Santee! While the April event was challenging due to the weather to say the least, Mother Nature has apparently decided to just skip Spring all together this year and get right into Summer… But hey, that’s Hoosier weather!!! Sunday, May 20, was a beautiful day with temperatures in the mid 80’s, though some were overheard to say a bit warm. The bass fishing at beautiful Lake Santee was even hotter as the fish really cooperated for our angling teams. Fourteen teams took part in the second event of the Lake Santee IN-47 Bass 2018 season. In keeping with a continuing tradition of father/son winners, this event did not disappoint. Tim and Carson Tennell captured first place with a limit of bass totaling 16.90 lbs, including the event's big bass of 4.98 lbs. The second place finishers were Matt and Scott Perkins, with five largemouth bass weighing 14.07 lbs. Great job to these dads and sons! The May tournament's trophies were sponsored by all the great folks at Scheidler Brothers Decorating, Greensburg, IN. Not only did they sponsor the plaques, but they raised the bar a bit and also donated $50 in gift certificates to the winning team! We couldn’t do this without their, and many other fine businesses, wonderful support! As evidence of the caliber of fishermen (and ladies) who participate in our tournaments, Scott and Matt Perkins had just returned from the two-day 2018 USA Bassin’ Ranger Classic at Kentucky Lake. There the pair had a very respectable Top Ten finish after being in second place following the first day. That finish was worth approximately $1,000 in a field of over 250 teams from all over the country. Great job Matt and Scott! May 20, 2018 standings are posted. Details to follow. Stay tuned! Well, just a few short days are left until the second event of the 2018 Lake Santee Bass Tournament season is held. We are looking forward to a great day, AND a lot friendlier weather conditions! With that being said, we have been told that the Lake Santee Security Water Patrol has been very active so far this year making sure our lake stays safe and secure. Please help us keep our great reputation of conducting safe, fun-filled, family events by operating your boat in a responsible manner!... and be sure those 2018 permits are properly displayed. This month's trophies are sponsored by all the great folks at Scheidler Brothers Decorating in Greensburg, IN. Stop in and speak to them for all your home decorating needs! We will see everyone Sunday morning (May 20th) at the Main Beach shelter-house for the pre-tournament meeting at 6:00 AM. We will take off at 6:30 AM. Recently we were forced to create a new Lake Santee Bass Fishing Page on Facebook. We have chosen not to go down that road and further discuss what precipitated this change. With that being said, we would like to encourage all of our anglers, and anyone elso who is interested in the lastest news, tournament updates, and information concerning our events at Lake Santee, to like and share our page, LakeSanteeBassFishing on Facebook. In order to differentiate from the two pages, our best advise is to look for the color photograph in the profile picture! Thank you to everyone for your understanding and patience in this matter. Well, the USA Bassin' Classic week has ended at Kentucky Lake for 2018 and the Lake Santee Division IN-47 team of Matt and Scott Perkins represented our division great! The father and son team ended up a VERY respectable 8th place out of a 220 boat field. The pair had a phenominal first day weighing in a 22.35 lb. limit, but with the changing conditions, were only able to manage 10.61 lbs. on the second day. This great finish awarded the Perkins several hundred dollars in money and prizes for their effort and was accomplished against Kentucky Lake stalwarts like Shawn Penn, All-American Qualifier Ronnie Grant, and FLW Tour Champion Craig "CP" Powers. Awesome job Matt and Scott! Our next Lake Santee Division IN-47 tournament will be Sunday, May 20, 2018 with takeoff at 6:30 AM. Make plans to be there! On Sunday, April 15th, the Lake Santee Property Owners Association / USA Bassin' Division 47 Tournaments kicked off their 2018 season… and what a day it was! Twelve teams gathered to take part on what is traditionally referred to as “Tax Day”, and with the heavy rain, high winds, and blustery cold temperatures, spending several hours in a bass boat was very taxing, to say the least! The father and son team of John and Brad Wilson took overall first place honors with three beautiful bass which weighed 10.82 lbs. Team Wilson’s bag included the event’s big bass, a 4.75 pound beauty as well as another bass weighing over 4 lbs. also. Second place finishers, the father and son team (Umm, are we seeing a pattern here?) of Tim and Carson Tennell, brought three bass weighing 8.61 lbs. to the scales to secure their showing. Great job to all these fishermen on a VERY challenging day! In keeping with the “Tax Day” theme, we would like to thank Mary Hamer and all the great folks at Klosterkemper Tax Services in Greensburg, IN for their continued support in sponsoring the April tournament trophies. Thank You, Mary!! Results will be posted soon. Stay tuned! We feel there is something we must re-address as it has been some time since this discussion has occurred. Lake Santee is a private lake managed by a home owners association, the Lake Santee Property Owner’s Association. That being said, all rules and bylaws enacted by the homeowner’s association must take precedence, first and foremost. We have received several inquiries concerning eligibility to take part in our tournaments. According to the by-laws, only boats registered to property owners who are members in good standing of the association are permitted on the lake. In addition, one member of the tournament team must be an association member or immediate family member (spouse, child, etc.). This rule, unfortunately, does sometimes exclude participation by folks who don’t meet those requirements. With all that being said, THERE ARE NUMEROUS LOTS FOR SALE at Lake Santee! These lots can be purchased for very reasonable prices and, in doing so, allows the owner(s), which can be up to FOUR (4) individuals per lot, full access to the lake and all included privileges. Interested parties may contact the Lake Santee Property Owners Association office six days a week to learn more about the property and obtain lists of lots for sale and local real estate agents contact information. If you are interested in becoming a part of one of the Midwest’s best bass fishing lakes, take a few minutes and research Lake Santee. As tournament directors, our goal is to include as many anglers in our events, not exclude them. However, we must abide by the association’s bylaws to do so. Thanks to everyone for their understanding in this matter. We just wanted to keep everyone up to date on the conditions of Lake Santee prior to this weekend's first USA Bassin' Division IN-47 tournament. The lake is now at full pool (Thank's to the flooding rains from several days ago!) but has a lot of color to the water. That being said, with the warming temperatures expected over the next few days, the fish should start to really turn on! One note of caution, there are several pieces of drift floating about the lake, some large enough to damage a lower unit or hull. Please use caution in the coming days and keep watch for large debris when operating your boats! See everyone Sunday, April 15th! As some of you are aware, Chip and I were out of town for a few days. That being said, we are now back! Anyone who would like to register for the 2018 USA Bassin' season, and has not yet done so, please get a hold of us this week. We would appreciate as many teams signing up as early as possible so as not to delay the registration process for our first Lake Santee IN-47 event on Sunday, April 15, 2018! We are less than a month away from the start of the 2018 Lake Santee Property Owners Association Bass Tournaments here at beautiful Lake Santee. With that being said, anyone wishing to sign up for USA Bassin' before the April 15th event (PLEASE!) should contact Chip or Lisa and make arrangements as soon as possible. Our contact information remains posted on the USA Bassin' website under Lake Santee Indiana Division-47. The 2018 USA Bassin' Regional schedules have been announced! Don't miss out on the opportunity and fun! We have received the 2018 USA Bassin' membership cards. Anyone wishing to register now for the upcoming 2018 season may contact either Lisa or Chip and we will get you signed up for the upcoming year. Don't wait until the last minute to join the fun at Lake Santee USA Bassin' Division IN-47! We have attached photos from the release of bass purchased by our fishermen. Take a minute to check out these photos! 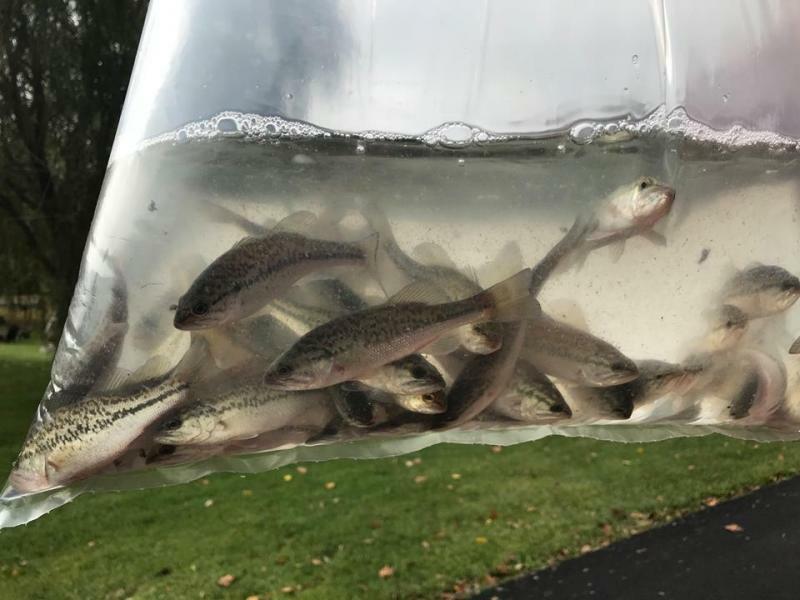 On November 3rd, 2017, approximately 100 more largemouth bass made Lake Santee their new home. These bass were again purchased from Clear Creek Fishery in Martinsville, IN with private money donated by all the great folks who fish the Lake Santee UBA Bassin' Tournaments, IN-47. Our fishermen and women take the phrase "Paying It Forward" to heart! To date, the group has stocked several hundred bass into Lake Santee the past few years for generations to come to enjoy. Thank you to Eric Hess and all the great people at Clear Creek Fishery for making this possible! Follow our anglers' lead and Please Practice Catch (Photograph!) and Release on all of Lake Santee's Bass! Here is the unofficial 2018 Lake Santee Bass Tournament schedule for the upcoming season. It should be noted that this has NOT been submitted to the L.S.P.O.A. Board for approval and IS subject to change. We are awaiting the release of a few other regional tournament trails before determining the official dates. Please take a moment and look over the dates as imput is always welcome from our anglers/teams. P.S.- A little bird has told us that plans are being finalized for an additional USA Bassin' Regional to be held at Brookville Lake in the fall of 2018... Stay tuned for updates! Well, that's a wrap! The final event of the 2017 Lake Santee Bass Tournament season was held on Sunday, September 24th and what a great event we had. While this was not a USA Bassin' sanctioned event, thirteen teams turned out to take part in the tournament which saw some of the hottest and stickiest weather of the entire summer. Of those thirteen teams, seven were made up of some form of family members fishing together, be it father/son, brothers, or spouses. It just goes to show that bass tournament fishing is a family activity enjoyed many of our members. Speaking of husband and wife teams, Don and Bonnie Mohr came out with guns blazing, putting five bass on the scales which totaled 19.91 pounds! Wow! That included the events big bass of 5.92 lbs. and another bass nearly that big... Great job Big O and Bonnie! Craig Duncan and his son-in-law, Kyle Hohenberger, finished in second place with 3 bass totaling 12.52 lbs. The pair narrowly edged out the third place team of Paul Bruns and Chuck Sieg, who brought four bass to the scales for 12.18 lbs. Great job to everyone taking part! Following the tournament , all the competitors, along with a few special guests gathered in the Community Room for a wonderful meal provided by Paul Pank of Hilliard Lyons of Greensburg, IN. Paul graciously sponsors a huge dinner at the last tournament of the season, something he has done for the past several years and his generosity is greatly appreciated. Should you wish to obtain any financial advise, please consider Paul and all the great people at the Greensburg Hilliard Lyons. We would also like to thank the Lake Santee POA Board for their continued support of our events and especially Board Member Carol Goodwin for sponsoring the plaques at this tournament. Without the Board's support, our tournaments would not be possible. The only task remaining for the 2017 is the purchase of largemouth bass to be stocked in our Lake Santee. As most everyone is aware, throughout the year, our fishermen donate money at each tournament. That money is then used in the fall to purchase adult bass from Eric at Clear Creek Fishery in Martinsville, IN which are then, in turn, released into Lake Santee. These bass are not part of the Association's fish stocking program, but are paid for out of the fishermen's pocket as a way of giving back to the resource. To date, several hundred largemouth bass now call Lake Santee home because of our anglers generosity and caring, proving positive actions will always trump negative attitudes. We would like to thank each and every person who either competed, supported through donations, assisted behind the scenes, or simply came to a weigh in for a great 2017. We look forward to a bigger and better 2018. The plaques are ready, the food is ordered, and the shelter house and Community Room are reserved! Make plans to take part in the End of the Summer final bass tournament for the 2017 at beautiful Lake Santee tomorrow, September 24th. This is a non USA Bassin points event open to all Lake Santee P.O.A. members. We will be fishing from 7:00 AM until 1:00 PM. The pretournament meeting will be held at 6:30 AM with boat draw and livewell check to follow. The meal, sponsored by Paul Pank at Hilliard Lyons of Greensburg, IN will be held after the weigh in and will begin at approximately 1:30 PM. We will see all of our anglers tomorrow! Our 2017 season has come to an end and we will begin looking forward to the 2018 season for the USA Bassin' Lake Santee Division 47. Congratulations to everyone for their successes and THANK YOU for making this our best season ever. As most are aware, many of our teams who take part in the Lake Santee Tournaments also participate in other circuits in our area. The State of Indiana DNR will hold their annual tournament draw in mid November, at which time most tournament organizations will set their schedules for the upcoming season. SHOULD ANY TEAMS PLAN TO FISH OTHER CIRCUITS, PLEASE CONTACT US WITH THOSE DATES AS SOON AS POSSIBLE. As always, we will attempt to schedule around other circuits to accommodate our fishermen and avoid placing our events on the same days as other tournaments. Don't be caught in that trick box of not communicating with anyone, only to have two events overlap next season. Good luck to everyone taking part in the various regionals. 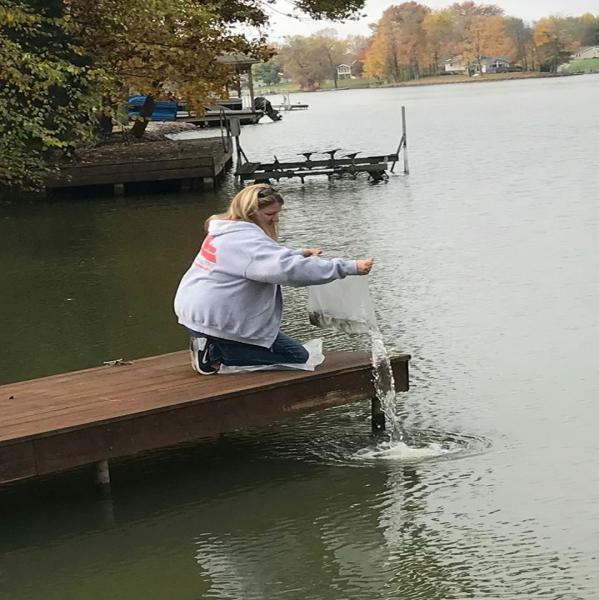 We are sure you will represent Lake Santee IN-47 well, as some of the best fishermen in the Tri-State are found at Lake Santee. Release of bass purchased by our anglers! Ready to go into their new home... Lake Santee!